FaceHammer Episode 72: Fyreslayers Review! FaceHammer Episode 68: UK AOS Masters 2018! FaceHammer Episode 71: Blades of Khorne! Episode 69: Flesh-Eater Courts Battletome! FaceHammer Episode 66: Gloomspite Gitz! FaceHammer Episode 64: FaceHammer GT 2018! FaceHammer Episode 62: BLACKOUT and EGGS! FaceHammer Episode 61: Midwest Meltdown! FaceHammer Episode 60: AoS 6 Nations!! FaceHammer Episode 59: Nighthaunt Battletome Review! FaceHammer Episode 58: Stormcast Eternals Battletome Review! FaceHammer Episode 54: Adepticon 2018! 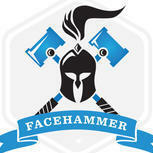 FaceHammer Episode 57: Malign Sorcery! FaceHammer Episode 56: Age of Sigmar 2 Core Rules Review"
FaceHammer Episode 55: SCGT 2018 review! FaceHammer Episode 53: Idoneth Deepkin Review! FaceHammer Episode 52: Adepticon Prep!